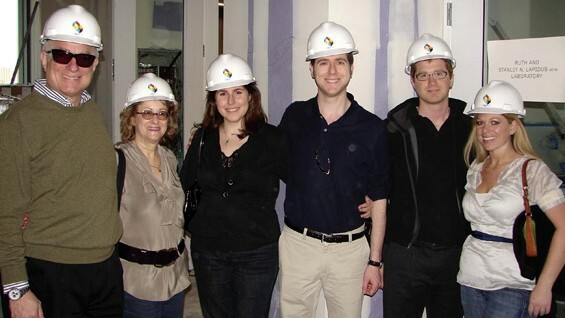 On Friday, March 27, together with husband Robert Karpinski and high school student daughter Samantha, Sara Nerken toured 41 Cooper Square, accompanied by Associate Dean of Engineering Simon Ben-Avi. 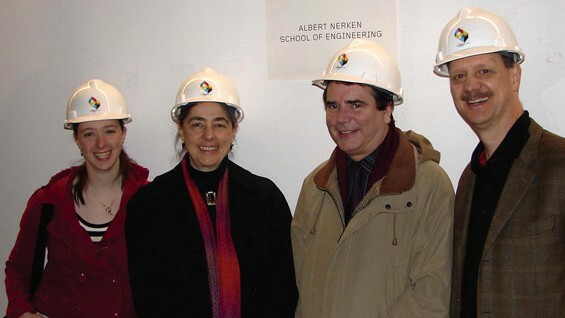 The new academic building will house The Albert Nerken School of Engineering named for Sara’s father, once it moves from the old Engineering Building in Astor Place. Albert Nerken (ChE’33),who expressed his deep gratitude to The Cooper Union by making an extraordinary gift to name the School of Engineering in the late 1980s, was co-founder in 1945 of Veeco Instruments Inc. (Vacuum Electronic Engineering Corporation), now a leading global provider of metrology and process equipment solutions. But as Sara told us, her father was virtually penniless when he attended the college. In fact, she said, on schooldays, his parents allotted him just 10 cents for round trip subway fare and another nickel for coffee. All three members of the Nerken-Karpinski family were fascinated with the building—and they were particularly interested in the eighth-floor Green Roof, because it turns out that Albert, besides being an outstanding engineer and amazing entrepreneur, was an amateur horticulturalist, and someone who,way ahead of his time, experimented in his home’s basement and backyard with organic chemical compounds and gardening techniques. It is therefore fitting that the Green Roof adjoins the Alumni Roof Terrace, where Albert will be recognized on a paver. Stanley Lapidus (EE’70) with his wife Ruth, his two sons and daughters-in law, visited from New Hampshire to see 41 Cooper Square on Friday, April 17. Stan, an alumnus and member of The Cooper Union’s Board of Trustees since 2002, was an early proponent of, and one of the lead donors to, the new academic building. Stan’s extraordinary generosity is being recognized in the Ruth and Stanley N. Lapidus EE’70 Laboratory, a state-of-the-art lab on the east side of the seventh floor, as well as on the Alumni Roof Terrace.Two large faculty offices on the northwest corners of the third and fourth floors will be named in honor of his sons David and Joel. Stan is founder and chairman of Helicos BioSciences Corporation, a Cambridge, Massachusetts-based life science company focused on innovative genetic analysis technologies for research, drug discovery and diagnostic markets. Earlier in his career at Cytyc Corporation, a company he also founded, he invented the breakthrough Thin Prep Pap Test, the most widely used procedure in the United States today to detect cervical cancer.